Description: Canned at the tower. 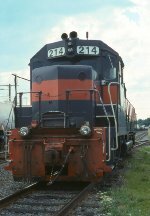 Description: ST 214 is part of SEPO's pick-up on the #2 track in front of the old tower. Description: Two GP35's were fired up and operating a now rare occurence. Description: Another NMED but this time with ST 214 leading appoarches Town Farm Rd.